Quick and convenient safety is close at hand with the AJC Tools & Equipment line of powerful magnetic sweepers. Our rolling magnetic sweeper with wheels features a heavy steel box, strong wheel brackets, and a folding handle for easy clean-up and storage. For hand-held convenience, choose from our hand-held magnetic sweeper or the AJC Mini-Magnetic Sweeper. Each magnetic sweeper is lightweight, portable, and ideal for use on pavement, in grass, or confined spaces. To pull even the most stubborn metal debris out of hiding, our Rolling Magnetic Sweeper Rake Attachment is highly effective, ideal for use in grass and gravel. Contact us with any questions you may have. AJC Magnetic Sweeper Pickup Tools – Made in the USA! This Rolling Magnetic Sweeper design is a first from AJC Tools & Equipment. Combining powerful magnets, quality workmanship, and a quick release design have made the AJC Rolling Magnetic Sweeper a favorite of roofers everywhere. This magnetic pick up tool has a heavier stainless steel box, stronger wheel brackets, and improved, tool free adjustable wheel height. It comes with big 7” diameter wheels and stainless steel magnetic box for easy clean-up. In addition, the handle folds over, making storage easy and convenient. Length: 30"
The AJC Hand Held Magnetic Sweeper is a spring loaded magnetic roof sweeper with a quick release that holds in down the position. Combined with powerful magnets and a stainless steel box, this 10 inch long magnetic pickup tool is sure to make cleanup of your job site an easy process. Our Hand Held Magnetic Sweeper is great for picking up nails on pavement or in the grass, and will save you time! In addition, the pickup of debris will greatly reduce flat tires at the site. 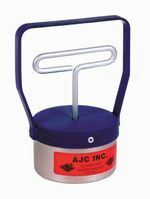 The AJC mini magnetic sweeper pickup tool is handy for a multitude of jobs, such as loading a nail bag, picking up nails in gutters and cleaning metal debris in confined spaces. The diameter is at 4 inches. This tool also features a spring-loaded quick release and stainless steel box. And don’t forget that all of our products are made in the USA! What sets this hanging forklift magnetic sweeper attachment apart is the heavy duty stainless steel and welded construction. This 48 inch wide forklift magnet can be suspended with a chain or a bar and it can be attached to forks, bumpers (front or back), etc. Featuring 1,000 lbs of magnetic pull, it’s sure to be able to handle even the toughest clean up. Make sure to be safe and always remove debris with a gloved hand. This magnetic pickup tool is proudly made in the USA and ships free in the continental United States! What sets this hanging forklift magnetic sweeper attachment apart is the heavy duty stainless steel and welded construction. This 48 inch wide forklift magnet can be suspended with a chain or a bar and it can be attached to forks, bumpers (front or back), etc. This magnetic pickup tool is proudly made in the USA and ships free in the continental United States! If you’re on a job site with a forklift, put it to use and make your clean up a breeze! The AJC releasable forklift magnet is 48 inches wide and can be suspended with a chain. The magnet can be attached to forks, bumpers (front or back), etc., and features 1,000 lbs of magnetic pull and a unique lever load release. Built out of heavy duty aluminum/steel welded solid construction, this magnetic pickup tool is proudly made in the USA. Free Shipping to continental United States!